It's time to VOTE for your favorite Feather Your Nest entry! We received a whopping 73 entries into the contest so brace yourself, this might be a tad overwhelming. So many fabulous projects, you guys! We are SO impressed by your clever and beautiful entries, great job!! You can make up to 3 selections, but no repeat voting. You have until Thursday, May 3 (12-midnight PST) to vote. Then the top 10 vote-earning entries will be up for a second round. Come back on Friday, May 4 to discover the 10 finalists and vote for your favorite. That round will go through Sunday, May 6. The winner of the popular vote will be announced on Monday, May 7 and will receive a prize. A second winner will be determined by our panel of judges. A third winner will be drawn randomly from all participants. Please go browse the Flickr pool and take a closer look at all the projects and their descriptions (the small square photos below don't do them justice!). Make note of your favs, then come back here to cast your vote. You can also see the full-size entry photo by clicking the numbered link below each pic. Please share this link with your friends and networks. The more people come vote, the more attention your lovely projects will get! Note: You might need to be logged into Flickr to see all entries. If you are a participant and your entry is not visible in the Flickr pool, make sure its permissions are set to "public" and that your Flickr account is set to "safe". Below are all the entries, in the order they were submitted. Scroll down to the end of the post to vote! Good luck to all our participants!!! Feather Your Nest: TOMORROW Is The Big Day! Deadline for submitting your projects is Midnight PST on Sunday, April 29 (TOMORROW). Please upload your entry photo to the Feather Your Nest Flickr pool (according to the requirements outlined below) or email it to us at stumblesstitches@ymail.com with the required info. Entries have been steadily rolling into the Flickr pool, and they are so beautiful and creative! Beginning on Monday, April 30, we'll open a "poll" so you can vote for your favorite entry in the contest and have your friends vote for yours! Finally, we'll let random.org pick a winner from the stitch-along participants. All winners will be announced on Monday May 7. We're so excited to see what you all have been working on! Such fun!! Happy stitching! Below for reference are the requirements for your entry in the contest. See more details here. GOOD LUCK!! The second project I finished for Feather Your Nest (after my His and Hers Bulletin Boards) was a cozy for our French press. It was such a quick project and turned out so well I thought I would share a tutorial! 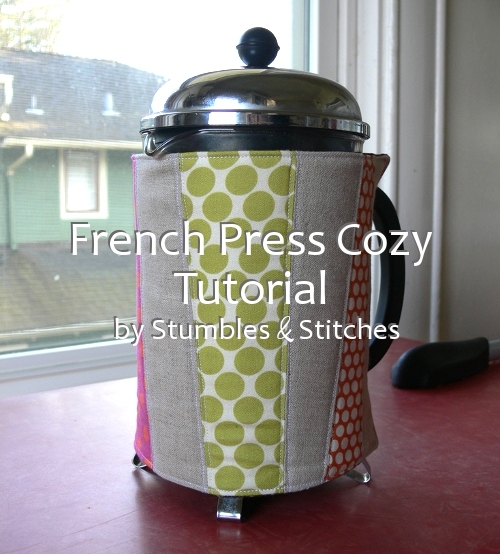 This is a tutorial for an insulated AND washable French press cozy. If you depend on the French press as much as I do (2 words for you: teething toddler *YAWN*), you know those two elements are nearly indispensable in a cozy. I like my coffee HOT and this definitely helps! I also regularly squirt coffee all over the place when pressing, so the washable aspect is awesome. 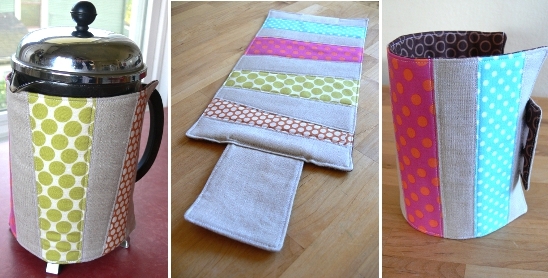 The idea to use scraps came from my friend Blair who shared with me her vision for making her own scrappy French press cozy. Thanks Blair! It just occurred to me that you could also follow the steps below to make a mug cozy! The measurements would be a bit smaller, but it is the exact same process. Hmmm. I might have to whip one up now! Feather Your Nest: Deadline Reminder! Here's a little reminder that this Sunday, April 29 is the deadline for submitting your entry in the Feather Your Nest contest and stitch-along. That's almost 4 days left to feather your nest, you can do it!! You can find out all the details for the stitch-along including requirements for entry and submission process HERE. How are your projects going? We can't wait to see what you all have been working on. The Flickr pool is expanding every day and we have been wowed by your beautiful and clever entries so far. If you need some motivation, go check out the prizes here, and the judges here. So exciting! Another Feather Your Nest tutorial is coming up later today, so please come back and visit. How's everyone's Wednesday going so far? As part of Feather Your Nest, some inspiring bloggers, designers and artists are inviting us into their homes for a little tour. We've asked them to share photos and thoughts of what "handmade" and "re-purposed" means to them at home. 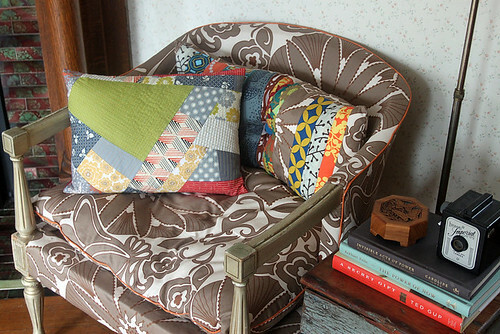 Today's Featured Nest installment is from Ellen at The Long Thread! If you've been around Stumbles & Stitches for long, you know we are big fans of Ellen's blog, book and brand new fabric collection. It's no surprise that Ellen's home is a reflection of her other creative work: eclectic, colorful and wonderfully curated. When my husband and I bought our house almost ten years ago, it had been owned by a slumlord and condemned by the city. The house was built in 1906, but many of the original features had been stripped, so we scoured the internet and salvage yards for mantels and stained glass pieces. The renovation was incredibly stressful and we ended up in a rental house while I was pregnant with our second daughter and on bed rest before the house was finished, but it's all a distant memory and I'm ready to renovate another one! 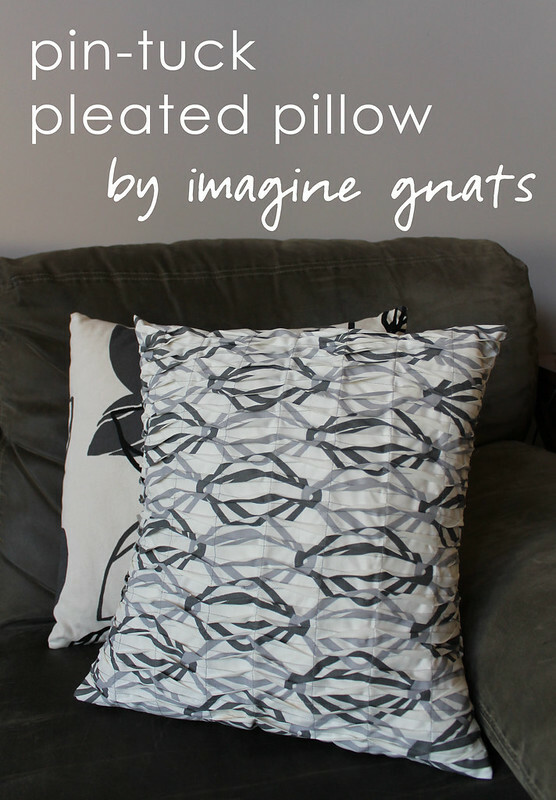 We're so psyched to welcome our dear friend Rachael from Imagine Gnats today with a super-duper awesome tutorial for a pin-tuck pleated pillow. I think both Angel and I said "wow!" out loud when we saw the photo of her finished project. We are so impressed -- and so excited that she is willing to dish about her sewing process here! We hope you'll pay Rachael a visit on her blog Imagine Gnats where she's constantly sharing her latest crafty adventures. Trust me when I say, the girl never stops and she is talented! You can also find Rachael on Facebook, Etsy and Pinterest. Without further ado, I'll let her take it away! Happy Monday! We have yet another lovely guest tutorial for you today!! 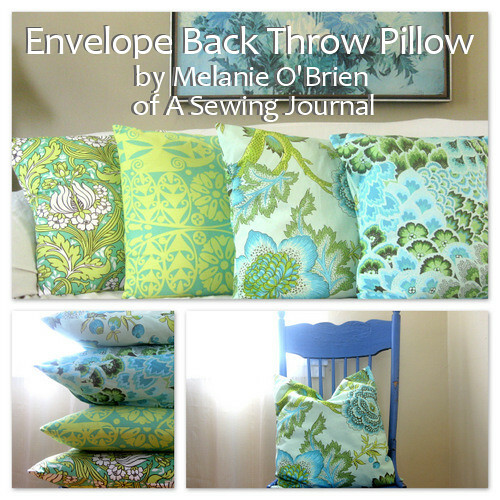 Welcome our friend Melanie from A Sewing Journal with the simplest, most perfect way to Feather Your Nest: easy-peasy envelope back throw pillows. Look how gorgeous hers turned out! If you are not familiar with Melanie's blog, please do yourself a favor and go peruse A Sewing Journal, you'll find beautifully curated inspiration galore. Melanie's shop on Etsy is Alice & Dorothy. You can also find her on Facebook, Pinterest and Flickr. Oh and I can't forget the awesome Sewing Trends column she writes for Sew Mama Sew! You can probably understand why we asked Melanie to be one of our judges for Feather Your Nest! A really fast and really easy way to spruce up your home is by making simple covers for your throw pillows out of your favorite fabric. Choosing stunning fabrics (like the Soul Blossoms fabrics I'm using) changes the mood of a room in a big way. And, you can whip out four of them (or more, if you choose) lickety-split! I re-used the boring, micro-fiber pillows that came with our couch (or that I picked up over time from here or there). Feather Your Nest is in full swing and we hope you've been busy -- both working on your own projects and visiting us for tutorials, free downloads and inspiration. Next week's schedule is jam-packed with awesome guest posts, tutorials and "featured nests"! Can't wait!! April 22 (tomorrow!) is the deadline for signing up for the Feather Your Nest stitch-along and contest. Check out the details and leave a comment HERE to sign up. April 29 (next Sunday) is the deadline for submitting your projects. Entries are starting to roll into the Flickr pool, and each one is more creative, lovely and "green" than the last. So awesome and inspiring! - In case you didn't see them, prizes were announced here, and judges were introduced here. Amazing and awesome, aren't they? Made by you, for your own home. Made with some repurposed or upcycled material. Post ONE photo of your finished item(s) in our Feather Your Nest Flickr pool, by April 29 Midnight PST. THIS IS YOUR ENTRY IN THE CONTEST. Please label your photo "Feather Your Nest ENTRY" in the title line, along with the name of your project. In the photo description, explain the materials (including the repurposed/upcycled aspect if it's not obvious -- this is IMPORTANT! ), as well as your inspiration, the item's purpose, and/or whatever else you'd like to say. Optional: link to a blog post or Flickr set where you provide more details and images. If you do not have a Flickr account, simply email us your entry photo with details at stumblesstitches@ymail.com. We'll post it for you. Here's another fabulous project, generously shared by our friends at Lark Crafts to celebrate Feather Your Nest. Embellish a lampshade with some pretty hand-stitched appliqué! This Pretty-ful Lampshade pattern comes from the brand new book Stash Happy: Appliqué by Cynthia Shaffer. Download the pattern PDF here. How perfect is this for Feather Your Nest? 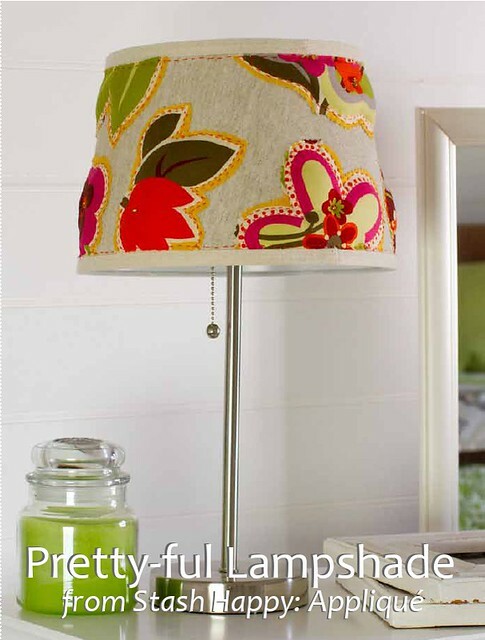 It's stitched, it upcycles an existing lampshade, and it creates a beautiful addition to your home! Thank you Lark Crafts for sharing this pattern with us! In case you missed them, we posted the patterns for the adorable Little Miss Mason Jars pattern from this book 2 weeks ago, as well as the Café Napkins from Sewn By Hand last week. Feather Your Nest is a month-long series here on Stumbles & Stitches focused on making things for our own homes. Along with featuring patterns, projects and guest posts, we're also having a sew/stitch-along and contest with amazing prizes! Make something for your own nest and get a chance to win. Check out all the details and sign up HERE by April 22. Entries are due April 29. Jen, I wanted to show you what's been going on around here the last few weeks. Ready for a quick recap? So you know we moved back into our house on April 1, my stress level went down by about half once I was back in my own home! The whole process was as painless as it possibly could have been (unless we'd won the lottery first, or had a secret benefactor paying for everything) but I really, really missed this house. 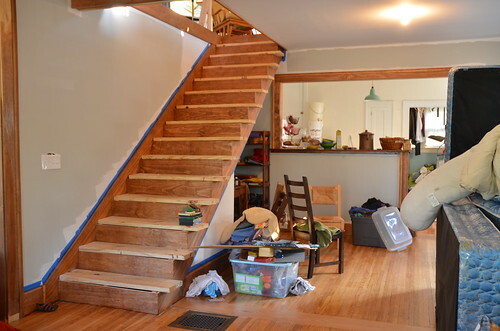 Can you tell in the picture up there that the staircase replaced the French Door opening that used to be between those two rooms? All three front rooms are basically one, large room now! 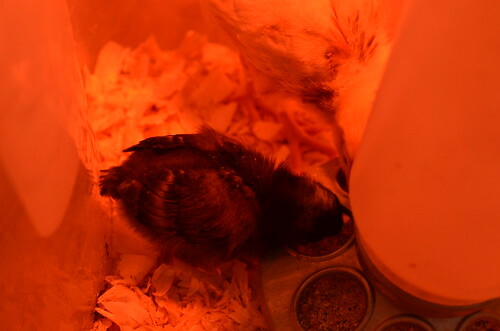 We also added these sweet chicks to the family (thank you Easter Bunny! ), it seemed crazy to bring one more thing to take care of into the mix, but we've wanted more hens for the last few years so we took the leap! They are so funny, and are healthy and growing like crazy. 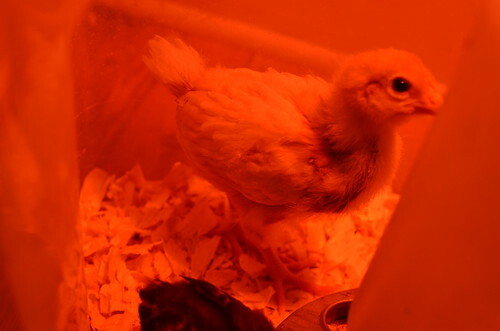 This weekend we'll get the coop cleaned out and bleached, the older chicks are almost ready to transition outside! 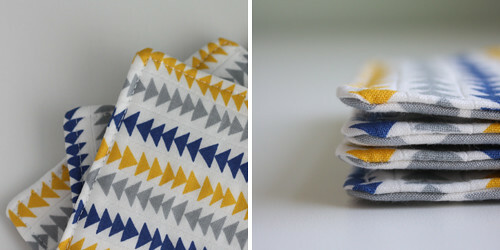 We're so excited to welcome Ellen Luckett Baker of The Long Thread today to share a quick and easy tutorial for coasters. 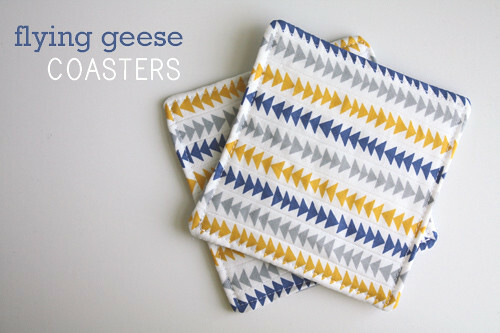 Coasters are perfect for Feather Your Nest, a simple yet very practical project to spruce up your home. 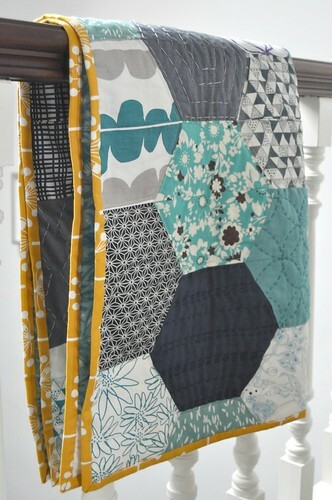 Ellen is the author of 1, 2, 3, Sew for Chronicle Books, and her first fabric collection called Quilt Blocks for Moda (featured in this tutorial!) just became available for purchase! You can find Ellen on her wonderful blog The Long Thread, as well as on Facebook, Twitter and Pinterest. These coasters were made with the same technique used for the Spring Pieced Coasters (featured on The Long Thread here), but cut from the Flying Geese fabric from the Quilt Blocks collection for Moda. This is a quick tutorial for string-pieced coasters. It seems that I do a lot of coaster tutorials on The Long Thread, but I’m a fan of quick, easy and useful things. And this is a great project for fabric scraps or striped fabric. 1. 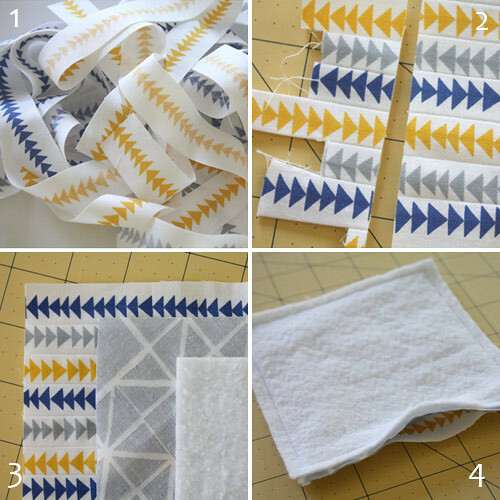 Cut fabric scraps with minimum 24″ length. If you're using fabric with a striped design like the Flying Geese print, carefully cut along the stripes accounting for seam allowance. 2. Sew right sides together until you have a width of 6″ or more. Press. Cut off sides and top to form a rectangle 5 1/2″ x 22. 3. 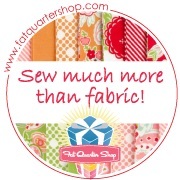 Cut out tops, batting and backing fabric in 5 1/2″ squares. 4. Sew around, leaving an opening to turn right sides out. Opening should be on a side with one continuous piece. Clip off the corners. 5. Turn right sides out, press and top-stitch around the coasters, thereby closing the opening. Huge thanks to Ellen for sharing this fabulous little project with us. If you need some additional inspiration for Feather Your Nest, check out The Long Thread's page of tutorials for the home. And be sure and take a look at Quilt Blocks. We're so excited about this new fabric collection and can't wait to get our hands on some! 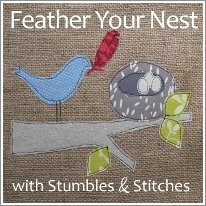 Feather Your Nest is a month-long series here on Stumbles & Stitches focused on making things for our own homes. Along with featuring patterns, projects and guest posts, we're also having a sew/stitch-along and contest with amazing prizes! Make something for your own nest and get a chance to win. Check out all the details and sign up HERE. Sign-up deadline is April 22, entries must be submitted by April 29. We'd love to have you join us! I'm so excited, I have already knocked a couple of things off my Feather Your Nest to-do list! To be fair, they were some of the smaller, simpler projects. But still! I thought I would show you the first project I completed. I'll save the other one for a bit later this week, since I'm hoping to turn it into a tutorial... Stay tuned! This is something I've wanted to do for ages: His and Hers Bulletin Boards! Our apartment is small, we only have one desk and it is usually consumed by paperwork, craft books, schedules, to-do lists, kid drawings, toys, board books, coffee mugs, sippy cups, AAAAAAH! You know how it is. Good morning Jenny! Oh boy, I have spent a lot of time at the computer the last few days, with no posts to show for it. I updated my Pinterest boards and did lots and lots of thinking about window coverings and re-purposing what I've got on hand......more on that later. I am sure this was subliminal, I can't remember if I saw the Bella preview before or after I picked out the dye colors I wanted. Either way, I can't wait to get my hands on some of this, I don't think I can swing enough yardage for curtains for five single and two double casement windows but maybe some new pillows? Happy Monday! We're so excited to launch our Featured Nest series today. As part of Feather Your Nest, some inspiring bloggers, designers and artists are inviting us into their homes for a little tour. 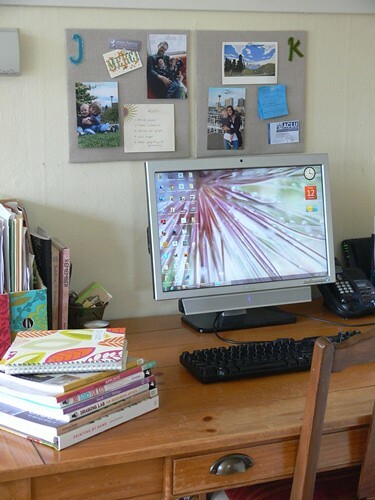 We've asked them to share photos and thoughts of what "handmade" and "re-purposed" means to them at home. First up is lovely Maureen Cracknell! 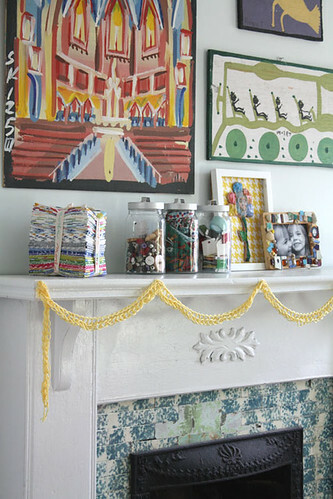 We're huge fans of her blog Maureen Cracknell Handmade, always brimming with colorful and crisp projects and photos. Maureen is incredibly talented, boldly creative and the sweetest person ever. We're thrilled to welcome her here today. You can find her on Etsy, Pinterest and Facebook. And please check the end of this post for an *awesome* giveaway! Right away when I began sewing in March of 2010, I started by making pillows. Lots and lots of pillows! Besides the kitchen and the bathrooms, every room in our house has at least one handmade pillow. I have been lucky to have my own work studio from the very beginning, which is always bursting with both supplies and my handmade items, but I realized quickly the importance of having my handmade items scattered throughout our house. More than anything, it just makes me feel good. I can see the things I make being used and how they add something unique and creative to each room, and I find it very inspiring. Hi Angel! I hope you're having a good weekend so far. Can't wait to see what you're up to with those curtains. I know you've got a whole bunch of ideas in the works for Feather Your Nest! As I mentioned to you in my drive-by morning email, I spent some time at IKEA yesterday. We're very lucky to have a store 25 minutes from our house! I had two reasons for going: returning a wall shelf that was not the right fit for a space in our kitchen, and getting more fabric for my dining room chair pads (more on that soon, hopefully). Of course, we ended up spending a few hours there, including eating lunch in the restaurant (Ben begged me for meatballs every two seconds starting in the parking garage). And of course I got more than just fabric. I stayed quite reasonable, but I did drool over a bunch of stuff. Since we are working on sprucing up our homes -- and our awesome readers are joining in the fun this month! -- I thought I would share some of my super budget-friendly and swoon-worthy finds at IKEA yesterday, geared toward organization and getting things in shape around the house. Honestly, there could have just been ONE item in this post. I have not been able to get it out of my mind! This is a new item at IKEA and I nearly fell over from the cuteness when I saw it. I seriously debated purchasing it, but there is no space or purpose for it in my home right now. But oh, I. LOVE. IT. It's sold along with the other kitchen carts, but you could store craft supplies, bathroom towels and toiletries, pots and plants and gardening supplies, the options are endless. The vintage design is adorable and it's a perfect size. Here's another free download from our friends at Lark Crafts! 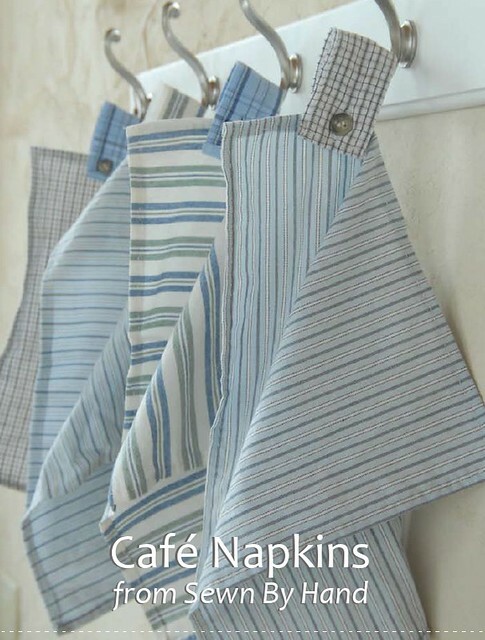 This project is called Café Napkins and comes from one of our favorite books here on Stumbles & Stitches: Sewn By Hand by Susan Wasinger. This project is perfect for Feather Your Nest, as it upcycles men's shirts AND involves stitches (either by machine or by hand)! Such a cute AND useful project. I've got a stash of old dress shirts from my husband just waiting to be turned into napkins! I love that this is a project easily sewn by hand too. Perfect to take along to the park or playground on sunny days. In case you missed it last week, we shared the adorable Little Miss Mason Jars pattern from the brand new book Stash Happy: Appliqué by Cynthia Shaffer. Feather Your Nest is a month-long series here on Stumbles & Stitches focused on making things for our own homes. Along with featuring patterns, projects and guest posts, we're also having a sew/stitch-along and contest with amazing prizes! Make something for your own nest and get a chance to win. Check out all the details and sign up HERE. Let's say a big welcome to our friend Jennet from Feathered Nest Studio who is sharing an original tutorial with us today. Jennet is an artist, crafter and mama. 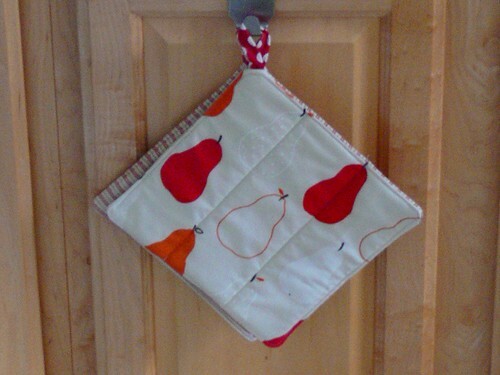 She is going to show us how to make a hanging pocket to store books, by repurposing a pillowcase. 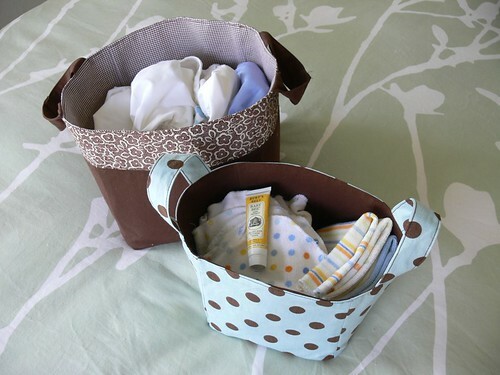 Perfect for Feather Your Nest and organizing those messy kids' rooms! I am so delighted to be guest blogging (and a Feather Your Nest judge!) on Stumbles & Stitches' blog! I simply adore all their projects and handmade goodies, so it is an honor. Hey Jenny! I loved looking at your to do list, I want to make every single project you linked to! I decided to follow suit, and went through the house making a list of my own. curtains. I have ten natural cotton tab top panels that fit the windows and I'm committed to using mostly what I have on hand, so we'll see what I come up with. I have a Pinterest board started just for curtains, I'd love to see any links you might find, in the comments! frame and hang photographs and artwork. napkins. Gathering old men's shirts (and a few of Ian's old button downs, too!) to make the pattern from Sewn By Hand! seat cushions. Our chairs are great, but the wicker part is coming loose. Temporary solution? Make some cushions! hey, I need a mouse pad too! curtains for double wide, multi pane window over a built in cabinet. I'll likely purchase a print for this window, it is recessed from the others so I don't think it has to be exactly the same. paint inside of built in, remove doors (?). Fun contact paper? curtain for window. I have a really cute chicken print that has some orange in it that I plan to use, I think it will look great with our new lights. towels. Thinking about flour sack for these, not sure yet! 3 large laundry bags and hooks to hang them on. hang shelves in closet and above dresser. There are about a blue million other things we have to do now that we're moved back in, but none of them even remotely relate to Feather Your Nest. I'm thinking curtains will be the top of my list, I don't know if I'll even get anything else done! Fabric baskets and laundry bags are pretty high up there too. We launched Feather Your Nest last Monday (have you signed up yet? ), announced prizes a few days later, and it's now time to present to you our judges! Along with being a month-long series focused on the home, Feather Your Nest is also a sew/stitch-along contest in which you make things for your own home and get a chance to win some fabulous prizes. To help determine the winner of the contest, we enlisted the help of 10 fabulous ladies who are as friendly and inspiring as they are creative and crafty. You know her from her fabulous blog The Long Thread. 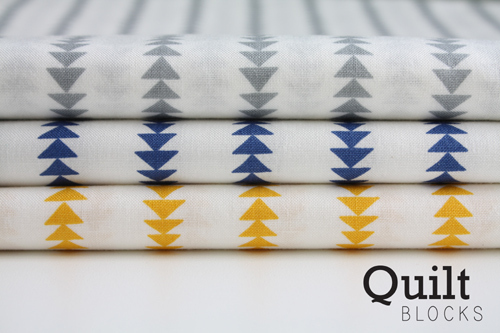 Ellen is also the author of 1, 2, 3, Sew and the designer of a brand new fabric collection for Moda called Quilt Blocks. You can preorder it here, whee! Rashida is the powerhouse behind the blog and brand I Heart Linen. 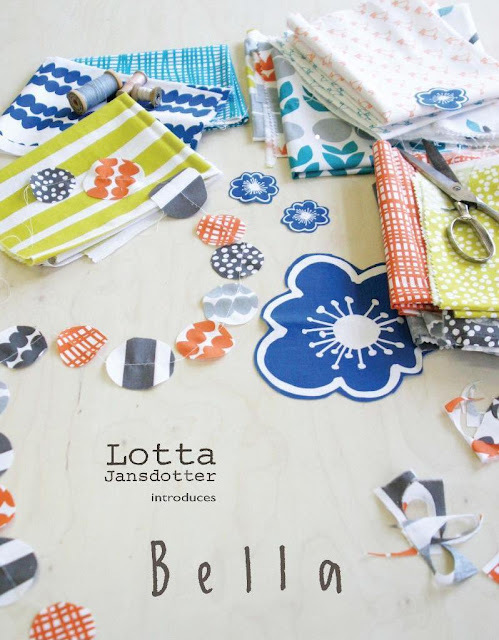 Her fabric lines I Heart and Washi have been super popular, and we love her books I Love Patchwork and the more recent Zakka Style. We befriended Rashida when she played with us on the Spring Runner Sew-Along last year and we're so excited to have her join the fun on Feather Your Nest! If you don't know Maureen's work yet, you're in for a treat. She is the sweetheart behind Maureen Cracknell Handmade where she shares her sewing, quilting and absolutely incredible free motion stitching projects. Check out her blog for adorable tutorials and constant inspiration. Jennet is a mom, artist, graphic designer, and art educator. Check out her shop on Etsy for quirky, whimsical and sweet items made by hand for kids and the home. Her Tumblr is an endless source of creative inspiration and her new blog has become one of my favorites for kid crafts, sewing projects and more. Kristin Link - Sew Mama Sew! Last but certainly not least, Melanie is rounding out our judging panel. Her blog A Sewing Journal is a fabulously curated selection of fabric collections, pattern and book reviews, sewing projects and more. We never fail to be inspired when checking in. Melanie is a regular contributor at Sew Mama Sew! with her awesome "Sewing Trends" series. We'd like to thank these wonderful judges for their participation!! We're so excited to be working with them on this series and sew/stitch-along! When you first brought up the idea for Feather Your Nest a few months ago, I remember thinking "That is a FAB idea, but I have no idea what I'll make." I didn't give it much more thought until recently when we got the wheels in motion for this little event and contest. And suddenly panic set in, what the heck would I make?? My practical project manager side took over and I went around my apartment, making note of every single thing I wanted to fix, make or redo around the house. And OOOOH BOY. Let's just say I'm not lacking in ideas now! I thought I would share what's on my to-do list, split up by room, with some inspiration photos. Then I'll pick 3 priority projects to work on this month. A lot of this stuff involves no stitches, so it doesn't apply for Feather Your Nest, but it'll give you an idea of everything I want to work on! Feel free to whisper I'm insane behind my back. If you need a cute and simple project to do over the holiday weekend, here's an adorable pattern from the brand new book Stash Happy: Appliqué by Cynthia Shaffer. 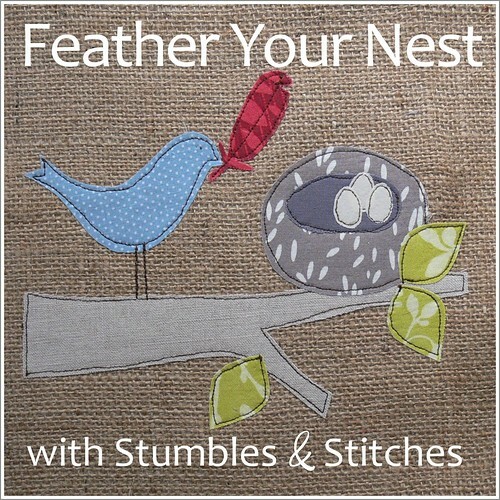 Our friends at Lark Crafts have generously offered a free download for you guys for our Feather Your Nest series! Download the PDF pattern here. 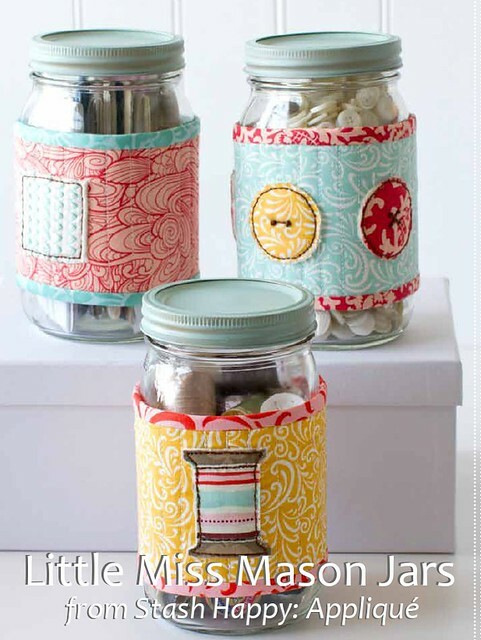 What a fun way to organize crafting supplies and other small knick-knacks! 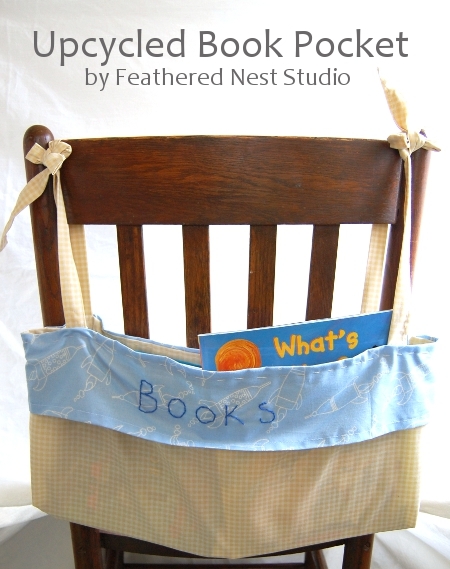 How about making your own version of this sweet project and entering it in the Feather Your Nest contest? Feather Your Nest is a month-long series here on Stumbles & Stitches focused on making things for our own homes. Along with featuring patterns, projects and guest posts, we're also having a sew/stitch-along and contest with amazing prizes! Make something for your own nest and get a chance to win. Check out all the details and sign up HERE. Have a lovely weekend! 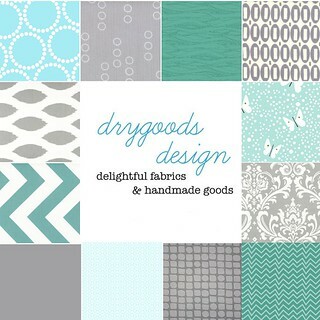 Our blog sponsors Fat Quarter Shop and Drygoods Design Online were super generous. Plus, our friends at Lark Crafts, Sew Mama Sew! and Imagine Gnats donated some wonderful prizes. And to add to that, Angel and I are throwing in items from our shops Demeter Rising Designs and Jenny Bartoy ~ Handmade Designs. Are you excited yet?! The winner of the Feather Your Nest contest, judged by 10 talented ladies from the craft and sewing community (to be announced very soon! ), will receive the following gifts (total value $350). Imagine all the fabric, fat quarter bundles, patterns and notions you could get with that! Heaven!! 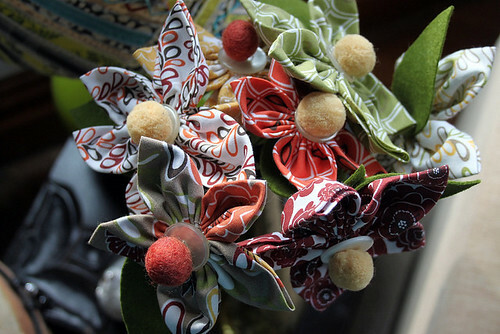 Fabrics will be similar to those pictured here but hand-picked by owner Keli as a surprise. 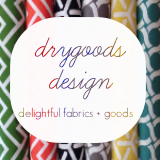 The winner can opt to receive a $75 gift certificate to Drygoods Design Online instead, to be spent on gorgeous modern fabrics. It seems we all need a little motivation to get rolling with Feather Your Nest! (If you haven't yet, check out our announcement and the details for participating in the contest, and *sign up*!!) I thought I would dig up some good projects and tutorials from our archives to give us a little kickstart. We'll also gather inspiration from favorite blogs around the web soon. Here they are. Click on the project name to go to the post. Everyone needs them in their kitchen! They come in so handy and are so fast to make. You can personalize them with favorite fabrics, some scrappy patchwork, and funky quilting lines. You can see other examples here. 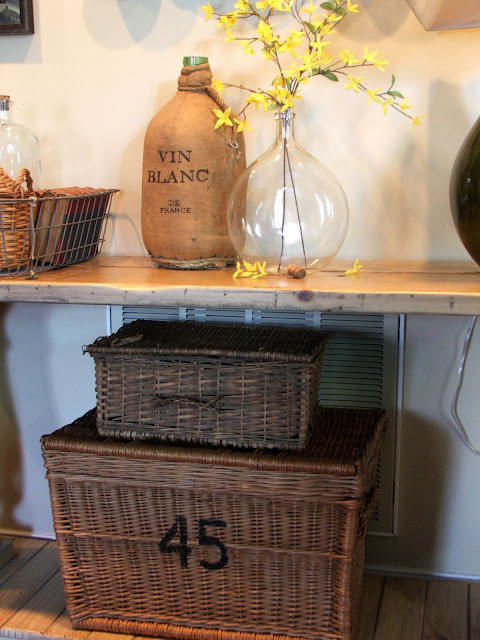 Great containers that are fast to make in various sizes and can match any room or decor. Feather Your Nest is officially beginning today. It will be both a sew/stitch-along contest AND a series focused on the home. Let's welcome Spring in handmade style: it's time to sign up and start making some lovely things for your own home! Read on for all the exciting details. and of course, progress and projects posts from Angel and me with photos and details of what we're making for our own homes this month! We hope you'll come by for regular visits! But more importantly, we can't wait to see what YOU are going to make for Feather Your Nest! Let's get to the details, shall we? Here is everything you need to know about Feather Your Nest! 1) Made by you, for your own home. This includes all sorts of practical and/or decorative items, housewares and artwork. As long as it is for use in your home, it works. 2) Made with stitches. 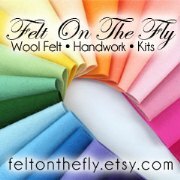 It can be machine-sewn, hand-sewn, embroidered, knitted, crochet-ed, felted, etc. 3) Made with some repurposed or upcycled material. As little or as much as you want. The options are endless! Get creative and think green. 4) Made in 2012. 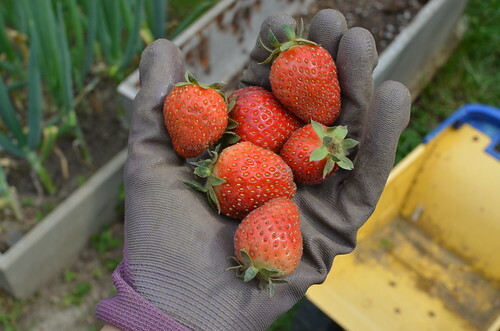 Ideally you will make something along with all of us this month to celebrate Spring. But in case you just finished a patchwork table runner or some pretty curtains a week ago, it's okay to enter that project. More details in FAQ at end of post! Comment on this post. This is your commitment to participate in the sew/stitch-along and contest so we can get a headcount. You can sign up anytime until April 22 (Earth Day!). Please make sure to include an email address -- either in the comment or as a link to a profile or blog. Make something for your home according to the requirements above. Post ONE photo of your finished item(s) in our Feather Your Nest Flickr pool, by April 29. THIS IS YOUR ENTRY IN THE CONTEST. Please label your photo "Feather Your Nest ENTRY" in the title line, along with the name of your project. In the photo description, explain the materials (including the repurposed/upcycled aspect if it's not obvious -- this is IMPORTANT! ), as well as your inspiration, the item's purpose, and/or whatever else you'd like to say. Optional: link to a blog post or Flickr set where you provide more details and images. You can enter as many as 5 items in the contest, as long as they meet the 4 requirements above. Share Feather Your Nest with your friends and readers! Grab our button, share the link, spread the word! The more people join in, the more fun this will be!! To participate in the Feather Your Nest contest, you must sign up by commenting on this post by April 22, Midnight PST. Your entry photo must be uploaded to our Flickr pool (or emailed to us -- see FAQ below) by April 29, Midnight PST. Your entry MUST meet all 4 requirements listed above to be eligible for any of the prizes. There will be 3 winners in the Feather Your Nest contest. Each will receive a prize. See here for prize details. Winner of Prize 1 will be chosen by 10 judges. Our judge panel featuring an array of talented ladies from the sewing and craft world (meet them here) will be reviewing and rating entries. Judging will be based on overall aesthetic, originality, creativity and craftsmanship -- as well as meeting all requirements of the contest (see above). The entry with the highest tally will be the winner of the judged contest. Winner of Prize 3 will be chosen randomly in the comments below. That's right! You get a chance to win a prize simply by entering the contest! The person chosen in the comments must have completed and submitted an entry in the contest to be eligible to receive the prize. Winners will be announced on Stumbles & Stitches and emailed on Monday, May 7. 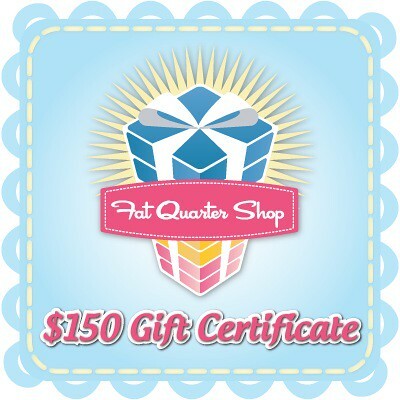 Our 3 Prizes include gift certificates, fabric, books and more from Fat Quarter Shop, Drygoods Design Online, Sew Mama Sew!, Lark Crafts, Imagine Gnats, and more. Our sponsors have been extremely generous! See details here. For additional details, please check the FAQ below. We'll be updating them if/when we receive questions and requests for clarification. And of course, leave a comment or email us at stumblesstitches [at] ymail [dot] com with any questions! Are you ready to play?! It's time to Feather Your Nest!! Go sign up in the comments! I made a shirt, I wear it in my house. Is it okay to enter it? / I made a cover for my Kindle, I use it in my home. Is that a valid entry? 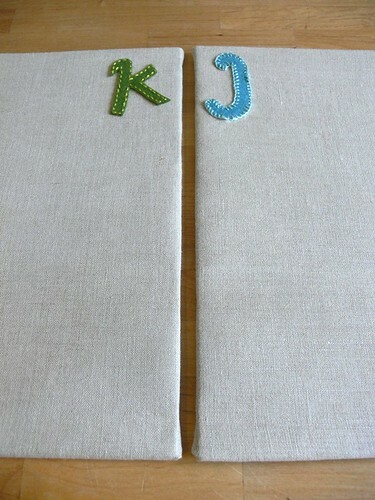 / I just made a beautiful table runner for my friend, can I submit it? Apparel and accessories for personal use do not meet the requirements for entry. Gifts for others, or made for you by someone else, do not meet the requirements for entry either. In other words: your entry must be something you made, that stays in your home for you and others to enjoy and/or use. Examples of applicable entries: pot-holder, pillow, coasters, table cloth, quilt, napkins, bunting, wall hanging, duvet cover, place mats, teapot cozy, curtains, etc. I'm stumped on what to repurpose for my project. Any suggestions? Include a lining from a vintage sheet, batting from a thrifted towel, some scrappy patchwork from upcycled pillowcases, panels from a felted sweater, buttons from a stained shirt, etc. It can be as little or as much as you want, visible or tucked inside as a hidden layer in lieu of batting. I don't have a Flickr account. How the heck am I supposed to enter this contest? If you do not have a Flickr account, simply email us your photo along with your descriptive blurb to stumblesstitches [at] ymail [dot] com by the same deadline. We'll upload the photo to Flickr and post it in the pool for you. I'd really like to participate, but I have no idea what to make right this second. Should I sign up? Yes! Sign up by leaving a comment here. No need to say what project you'll work on. Your comment is your commitment to join in the fun and make something for your home. We find it's a good motivator. But you have the whole month to come up with something and make it. The deadline for submitting your entry is April 29.